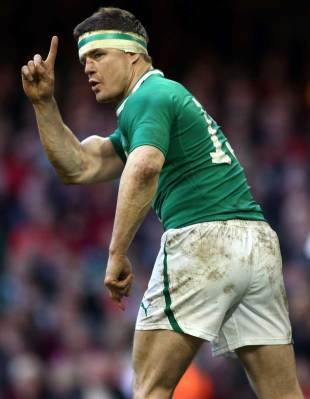 Just how influential is Ireland's Brian O'Driscoll? In this edition, John looks at France's previous Five/Six Nations Championship woe, try-less encounters, brothers to have played for England and the influence of Ireland's Brian O'Driscoll. When did France last lose their opening two Five/Six Nations matches - and when was the last time they lost four Championship matches in a row? The defeats against Italy and Wales on the opening two weekends of this season's tournament were the worst start by France since 1982, when they lost to Wales and England. They subsequently went down against Scotland at Murrayfield that year before denying Ireland the Grand Slam by winning their last match of the season, 22-9, in Paris. Philippe Saint-André's side have now lost four Championship matches on the trot. They were beaten by England and Wales in the last two games of last season's tournament. This is their worst Championship run for 55 years. They were last whitewashed in the old Five Nations in 1957 and opened their 1958 campaign with defeats against Scotland and England. The French finally revised their side in March 1958 and ended their six-match run of Championship defeats by winning at Cardiff (for the first time) and defeating Ireland in Paris. The following year they won the International Championship title outright for the first time and remained kings of the Five Nations until 1962. The only other post-war run of four defeats that France have suffered in the Championship was between March 1947 and January 1948. Their all-time worst sequence was 17 Championship defeats between 1911 and 1920. How many Six Nations matches have been try-less? Sunday's match between Ireland and England in the Aviva Stadium, Lansdowne Road was the 201st in the Six Nations to date. It was only the eighth time that a try-less match occurred in the tournament and it produced the lowest points-aggregate for a match in the competition's 13-year history. (Italy's 13-6 win against Scotland on the final weekend of last season was the previous lowest aggregate). Of the 69 goals comprising the points in these try-less games, all bar three have come from penalty kicks. Ireland managed a dropped goal in the 15-12 win over France in 2003 and Scotland did so twice against England: in the 18-12 win in 2006 and in the 15-all draw of 2010. How many times have Brian O'Driscoll and Gordon D'Arcy lined up together as Ireland's centre-pairing? Sunday's match at the Aviva Stadium was the pair's fiftieth start together as Ireland's centre-pairing in Test matches, the ongoing world record. Each made his Test debut in 1999, O'Driscoll against Australia at Brisbane in June and D'Arcy as a replacement against Romania at Lansdowne Road during the Rugby World Cup. They had to wait five years, however, for their first start together as a pair. That came against Wales in a 36-15 triumph at Lansdowne Road in February 2004. Have England ever fielded two sets of brothers in the same Test team? Billy Vunipola was reportedly close to the England match-day squad for the game against Ireland in Dublin last weekend. He and his brother Mako could then have joined Tom and Ben Youngs in the same England team. Only once have England fielded two pairs of brothers in a Test side. Percy and Frank Stout of Gloucester were joined by the Davidson brothers, Jos and Jas from Aspatria, in a side that lost 5-0 to Scotland at Blackheath in 1899. Twice before, England fielded two pairs of brothers in the same calendar year. In 1875, the Grahams (Wimbledon Hornets) and Birketts (Clapham Rovers) won caps and in 1882 the Gurdons (Richmond) and Hunts (Manchester) were capped - but never did all four appear in the same match. How does Ireland's Six Nations record compare with and without Brian O'Driscoll present? Brian O'Driscoll's career has completely spanned the Six Nations era. He made his debut in the Championship against England at Twickenham in 2000, has played in 57 out of a maximum 67 matches to date and only Ronan O'Gara (62 appearances) has played more times in Six Nations games. So Ireland's difference in success-rate with and without him is +26.93 percentage points - an impressive measure of the value he adds to Ireland in the tournament. So, with O'Driscoll as captain Ireland's Six Nations success-rate is 19.84 percentage points higher than without him in charge.